The 118th running of the Boston Marathon was absolutely spectacular on so many levels. The field was huge - 36,000 entrants, the crowds were gigantic and enthusiastic and the weather was nearly perfect but this year was special. Hanging over the event was the memory of last year's marathon bombings and a palpable sense of renewal and determination to triumph over the senseless violence that affected so many lives and brought the race to a premature close. The people of Boston responded to the tragedy with amazing warmth, welcome and generosity towards the runners on and off the course. 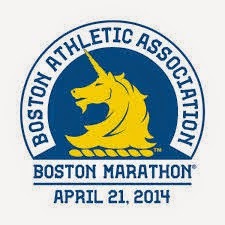 The BAA and the City of Boston orchestrated this event with such precision that there is no question why this race is such a premier event and so significant to the running world. As always, the course was tough and served up a mixed platter of surprises and disappointments for all levels. Meb Keflezighi, 38, of San Diego was the first American in 31 years to win the men's race with a time of 2:08:37 while Shalane Flanagan of Marblehead, Mass, considered to be a strong contender for the women's title, came in with an amazing time of 2:22:02, a new American women's course record but only 7th place in a really tough field. The women's winner, Rita Jeptoo, 33, of Kenya, repeated her winning performances from last year and 2006 with an astounding time of 2:18:58 - 2 minutes faster than last year. As for Club Ed and friends, I have provided the accounts of those that I know for certain and have refrained from passing on rumors about getting eaten up by the hills or bad shoes choices. Greg Eng delivered the best time of the field with a time of 2:45 to redeem himself after a tough LA Marathon finish of 3:05-ish only one month ago - nice job!. Will Longyear brought home a 3:01 by running it the hard way - going out fast and paying for it all through the hills. After weeks of equivocating about poor projected finish times due to chronic plantar faciitis and a slow recovery from a recent surgery, Jon Megeff and Mark Shalvarjian were revealed to be the massive sand-baggers that they are by handing in 3:03 and 3:07finishes, respectively. Despite their apparent injuries, both ran very strategic races that enabled them to maximize their race enjoyment by high-fiving as many kids as possible and "lingering" at the Wellsley wall. Shalvarjian managed to negative split every 10K, including the hills. Bill Weber also delivered a 3:01 and had the best seed to finish ratio - Bib: #5733 / Finish: 2672 place (factoid included for Mark Silva). Recent San Diego transplant and former Club Ed member, Sam Dillman ran a solid 3:05. The "Perseverance in the Face of Adversity Award" goes to Tami Shalvarjian for running the entire race on an injured foot that caused a compensating stride resulting in a massive blister on the injured foot. Matt Knight gets the "Never Leave Your Wingman Award". Following a nice 3:48 finish, he spent the evening in the Med tent with a severely dehydrated buddy and forewent a well deserved evening of celebration.